"Fight Smart, Not Just Hard"
Enthusiasm and beautiful weather for Inaugural 5K4Life! Last Sunday, October 25, hundreds of people joined forces in Prize4Life’s first annual 5K4Life, a road race to raise money for Prize4Life and ALS research. We had a beautiful day, a terrific turnout, and lots of enthusiasm. Runners came from colleges and universities, from local running clubs, from corporate, biotech, and research organizations, and from the Prize4Life family. Prize4Life was lucky to have the help of volunteers from the East Boston High School Key Club, who arrived bright and early to help set up. They distributed t-shirts, helped stuff race bags, and served food. Other dedicated volunteers lent a hand at the registration table, the water stop, and the finish line. People surged across the start line when the horns sounded, wearing electronic timing tags. 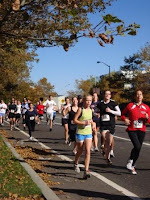 Participants ranged in age; most ran the course (11-year-old Eliza from Natick took fourth place in the female 1-19 division and Dr. Seward Rutkove, who won one of Prize4Life's progress prizes, took second place in his age group). Some folks and families with young children walked, including Prize4Life Board members and a 54-year man old recovering from a double lung transplant. Corinne Casey won the overall women’s division, and Robert Cipriano won the overall men’s division. See the full results (including results by age group) here. 'White Collar Crime,' Boston's leading benefit band, played upbeat music as the runners started off, and all through the post-race picnic. After the race runners and spectators mingled, enjoying a picnic lunch and the pleasant day, and discussing Prize4Life with the staff and Board members present. Sponsorship for the race was generously provided by Genzyme, Biogen IDEC, Shire, Microsoft, Harpoon Brewery, Marathon Sports, Barker Graphics, Recognition Services Incorporated, the Grossman Marketing Group, White Collar Crime, Save That Stuff, and Yogi Cereal. The event was a tremendous success its first year (see the list of top fundraisers and fundraising teams here). Runners and participants were very positive about the day. We’ll have a picture gallery up shortly, so keep an eye peeled for more great photos. An extra shout-out to all of our volunteers--we couldn’t have done it without you! 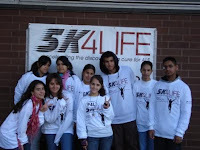 Thanks to everyone who ran, raised money, or cheered us on, and we hope to see you at the 2010 5K4Life! On October 14 Allison Kotzin and Peter Bowen, two former Prize4Life Board Fellows, organized and hosted an event at the 28 Degrees Lounge in Boston. It was a screening of the ALS film “Trapped”, held as a fundraiser for Prize4Life, and it raised over six thousand dollars (with donations still coming in). “Trapped” is a provocative new film shining a bright light on the plight of individuals and families living with ALS. The film chronicles the life of a brilliant young composer who discovers he has ALS after an eerie progression of symptoms. Though he loses his ability to physically write music and play the piano, he refuses to cede his spirit and genius to the disease. The film was written and produced by Jim Mahoney and Zach Lewis, and directed by James Takata. It boasts music by Michael Mollo, and was written at the urging of Amy Yamner, the Chair of Prize4Life’s Board (read an interview with Takata, Mahoney, and Lewis here). Yamner had seen a film about Alzheimer’s disease that had generated attention and moved Alzheimer’s into the public eye; she thought a similar project could be undertaken with ALS. She was right. The film is evocative and haunting, and showcases both the horrors of ALS and the talent of its writers, producers, and actors. Allison and Peter put on a great party, and Prize4Life co-founder and CEO, Avi Kremer, was present for the evening. Prize4Life President James Giessler gave a moving speech after the screening, and Prize4Life was fortunate to be able to hold a silent auction as well. The 28 Degrees lounge generously provided the space and appetizers for the event. Prize4Life supporters from near and far came to see the movie, talk with each other and with staff, and to hear about Prize4Life’s new work. The event showed that, even in these difficult economic times, Prize4Life’s dedicated volunteers are able to convene generous donors and an engaged support base. Donors and activists are willing to support compelling causes, and “Trapped” is an incredibly artistic, moving tool that raises both awareness and funds for ALS and Prize4Life. Do you know a group of people who would be interested in seeing the movie? Could you host a screening for us? Send us a note at contact@prize4life.org, and together we can push for more research, more treatments, and someday soon, a cure. Like most of the 1,000 or so patients with ALS and their caregivers that I have seen over my last decade in this field, I’m sure I would fight it...But without all my years of scientific and on-the job-training, would I know the best direction to go in? A Google search on ALS would certainly tempt me to consider that the diagnosis was wrong. Maybe it’s Lyme disease or heavy metal poisoning, I would wonder. Further browsing of the Internet and conversation in online chat rooms would make me want to try a number of alternative or off-label therapies for the disease...but...I have learned that there is a better way. I’ve seen data showing that the diagnosis of ALS, when made by an experienced neurologist, is almost always correct. Therefore, once I had an opinion from an ALS expert, I wouldn’t need to expend a lot of energy considering other possibilities. In addition, ALS experts have already looked critically at many of the alternative and off-label options being pursued and found no merit to them. Thus, instead of furiously chasing these down, I would pursue the treatments that have been shown to prolong life and/or preserve quality of life; these include riluzole, early bipap, optimal nutrition, and care in a multi-disciplinary clinic. Realizing that research is the only sure way that I (and everyone else with ALS now and later) will get closer to a cure, I would try to participate in every study that I could, monitoring legitimate Web sites like clinicaltrials.gov to look for opportunities. Knowing that this is a rare disease, and one in which research funding is desperately needed, I would “burn and rave” as an advocate, doing all I could to raise awareness...I would travel to National ALS Advocacy Day every year to make sure my elected representatives understand how tough this disease is and that they continue to support programs that help ALS patients and caregivers. I would stay in this fight even if my loved one eventually lost his personal battle with the disease. In the end, would the things I’ve learned ultimately save me or my loved one from ALS? Unfortunately, they might not...experience treating people with ALS simply maps a path which optimizes the possibility that something good will come from all the valiant efforts. Like Dr. Bedlack, Prize4Life is working hard to accelerate research to find a cure. As ALS Advocacy aptly points out, sometimes it's hard to fight smart when it's not a fair fight. We admire all the brave PALS who have worked and continue to work tirelessly to raise money, awareness, and to promote research to treat and cure ALS. Thanks again for all you do. Andrew Vickers is a biostatistician working on cancer. Throughout his career, he has requested underlying datasets from several researchers at different times to help advance scientific studies, and has been refused more often than not. He was perturbed enough to write an essay in the New York Times about it, in which he advocated making clinical trial data freely available. Dr. Vickers cited the work of Dr. John Kirwan, a rheumatologist from the University of Bristol, who has studied researchers’ attitudes on sharing clinical trials data. Dr. Kirwan found that three-quarters of researchers he surveyed, as well as a major industry group, opposed making original trial data available. In an article published in Nature magazine on the same topic (“Making Clinical Data Widely Available”), Jocelyn Kaiser writes on difficulties of sharing raw data among scientists. The issue is complex; researchers often embrace the idea of sharing, which can open channels for independent scrutiny, foster collaborations and encourage new discoveries in old data. In practice, however, those advantages often fail to outweigh researchers' concerns. Some researchers in her article were concerned that open-access could lead to erroneous interpretations. Epidemiologist Bruce Psaty warned that investigators could conduct erroneous risk analyses, or that young researchers could become too dependent on data mining, and neglect designing their own rigorous studies. “They don’t want to be scooped,” says Christine Laine, senior deputy editor of the Annals of Internal Medicine. “It is worth restating this finding: most scientists doing research on how best to help those in pain, or at risk of death, want to keep their data a secret.” Dr. Vickers finished. However, the trend of keeping data private is perhaps beginning to change. Data-sharing advocates say that the power to encourage data sharing rests largely with those who have always had the most clout in science: the funding agencies, which can require data sharing in return for support, or journals, which can make sharing a condition of publication. Many such agencies have begun to encourage data sharing through those mechanisms. This trend appears to be spreading slowly across different parts of the scientific landscape. ResearchGate recently launched a Self­Archiving Repository, which provides members with free access to potentially millions of research papers without the obstacle of library subscriptions or the financial barrier of pay-per-view. Nature magazine’s policy is similar. “An inherent principle of publication is that others should be able to replicate and build upon the authors' published claims. Therefore, a condition of publication in a Nature journal is that authors are required to make materials, data and associated protocols promptly available to readers without preconditions,” says the website. Just being here is already a victory. That’s what I keep telling myself, anyway. As my family and I stand near the starting line of this year’s ALS Walk4Life, basking in the sunshine and the positive vibes emanating from the 100+ people on our team, I’m trying hard to prepare myself for the disappointment of not being able to complete this two-mile Walk. And while it’s true that just being here at all—-an astonishing five years after my ALS diagnosis—-is something I hardly dared hope for, I’ve also been secretly telling myself that if there’s any way sheer force of will can make a difference, I will cross the finish line on my own two feet. Because this year, the Walk is more personal than ever. I can’t stop thinking about our ALS support group friends who died this year. I can’t stop thinking about the online friends I’ve made and lost. I don’t know why I lucked out to still be here five years later, and frankly, I feel more than a little survivor’s guilt. I do know that if it’s at all within my power to complete this Walk I will do it to honor them. As teams take off across the starting line, we see many, many people wearing t-shirts or carrying signs indicating that they are walking in memory of a loved one who has lost the ALS battle. My mind shifts to the countless other walks held for cancer, AIDS, diabetes, and so many other horrible diseases. I can’t help but wonder about the numbers of teams walking with a patient or survivor of those diseases versus those walking in memory of a patient who has died. Is it possible that any other walk has a worse ratio than we do? Given the merciless pace of ALS and the lack of any effective treatment, I doubt it. And that leads to one of my major frustrations with this disease, as well as one of my major motivations for trying to raise awareness and money. How is it possible that 70 years after Lou Gehrig died, the prognosis for a newly diagnosed ALS patient is no better than his was way back then? How is it that the life expectancy hasn’t budged? How is it that so many other diseases—as heartbreaking and insidious as they are—at least have treatment options? That they have survival odds somewhere above 0 percent? As we walk, we are confronted with signs quoting familiar statistics many ALS families could recite in their sleep. Each one is more dismal than the last. But as I read them, my anger builds. And, in turn, so does my determination. I can’t tell if my heart rate is rising from exertion (probably) or from impatience (probably that too) at the unchanging stats. These stats, while true, are too sterile. These stats, disheartening as they are, don’t even begin to convey the harsh reality of the thousands of families living with ALS. They don’t convey what it’s like for a little girl to watch her dad’s strong frame shrink, for her to help feed him when he can no longer lift a spoon, for her to bat away mosquitoes that he can’t. They don’t convey what it’s like for the boy who remembers his mom playing tag and follow-the-leader with him, who sees her choke and sputter and gasp after taking a simple sip of water, who wonders whether she can hang on until he can grow up and find a cure. I pause to catch my breath and take in the scene. Teams have been passing us all along, and our group is likely the last one on the course. I want so much to quit, to succumb to the fat cushion on my wheelchair’s seat that’s been taunting me for nearly two miles. We’re in the home stretch of the Walk now, and I’m barely moving. As I take a deep breath and stumble onward, I see a kind of parallel between this stage of the Walk and the ongoing search for that elusive treatment or cure. Where are we in terms of progress toward our goal? Are we in the home stretch? Or barely moving? Seventy years since Gehrig’s death, I sometimes wonder. Finally, mercifully, the finish line comes into view. I tumble into my wheelchair, out of breath but exuberant, and look around at all the young kids from our team cheering along the sidelines. And it is in their faces that I see the other reason I wanted to finish this Walk. When those children grow up, will they have friends who have ALS? Will the prognosis still be the same? Or will the breakthrough finally have come? Will they have friends who are managing ALS while living fairly normal lives? Or friends who had ALS, were treated, and now are ALS-free? That would be the sweetest victory of all. One of the more moving ALS awareness campaigns of 2008 came from the ALS Society of Canada, showing a father’s deterioration. “Sarah’s Story”, an extremely powerful ad by the UK MND Association, was banned earlier this fall. In 2009, the Florida chapter of the ALS Association (ALSA) launched its own moving ALS awareness installation entitled “Stealing Pieces.” The exhibit has been travelling across the state since early 2009, and is booked into 2010. At first glance, the “Stealing Pieces” installation looks like an experimental fashion project. More than one hundred mannequins, dressed only in black t-shirts, are positioned in precise rows across parks, malls and other public areas, spaced to resemble a graveyard. Upon closer inspection the shirts read: “Lou Gehrig's disease is stealing our loved ones piece by piece,” (see a close-up photo here). On the back of each shirt is the name of a Floridian affected by the disease, their birth year, and sometimes their year of death. The mannequins are armless, legless, headless, and scarred with use. The ultimate impression is eerie and haunting. The installation was conceived by Tampa’s Dunn & Co. advertising agency, who donated its time and resources to the creation of the exhibit. Conceptually, the campaign was intended to mimic the disease progression in ALS patients. As occurred with “Sarah’s Story”, the ALS Association of Florida saw a significant increase in the number of volunteers and donors during the first few months of the exhibit. ALSA has said that more than 60% of donations to the exhibit come from first-time donors, indicating that this project is indeed powerful.